Francina van Reede could not bear to see her unfaithful husband desert her by sea. She decided to throw herself off the rock. With that attempt fallen flat, the Dutch official’s daughter went on to marry for a second time eight years later. Her father erected a pillar to remember the incident. 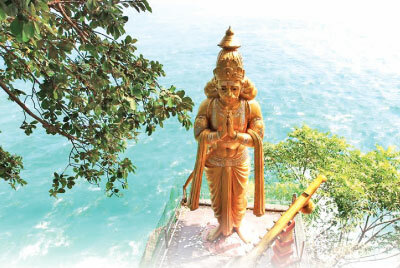 So goes the background narrative of the Lovers’ Leap famously nestled in the premises of Koneswaram Kovil, Trincomalee. Photographing the Lovers’ Leap in a perfectly proper angle turns out to be the hardest task under the harsh sun that bears down on the Koneswaram Kovil’s sand at daytime. The kovil is said to have existed even before the arrival of Prince Vijaya. The history has it that Indian Pallava, Chola and Pandya kings had contributed to the upbringing of this religious site. The Koneswaram temple is believed to have been a major religious shrine since before the arrival of Prince Vijaya 2500 years ago. 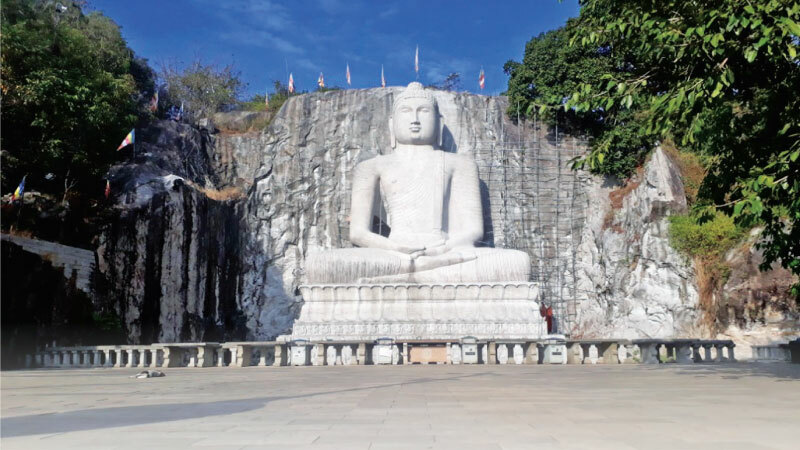 The Internet’s celebrated encyclopaedia, Wikipedia, tells us that this shrine was demolished by the Buddhist King Mahasena, who ‘built a Buddhist temple and Dagoba in its place’, but cites no reference to support the fact. Located close by is the Swami Rock, another name for Lovers’ Leap, which has adorned the folklore of the city.A folktale elsewhere has two devoted lovers make a leap from atop the mountain, to be rescued by a Swami. Koneswaram Kovil is synonymous with Trincomalee. The name rings a bell to any tourist, be it local or foreign, owing to its amazing waterfronts. The waterfronts are now the centre of attraction. The same cynosure was subject to attacks over the centuries in myriad forms. Following the South Indian entrance, the spot became a target for the colonial masters beginning from the Portuguese through the Dutch and then to the British. Trincomalee simply explains why Sri Lanka deserves a visit. It accommodates a world-class natural harbour. The city has its own account of history chronicled down in the text. The long and empty stretch of Trincomalee road passing Habarana may give you the creeps at times. And that is not without a justifiable reason. The high voltage wires issue the first warning. The fence meant to keep the elephants away indicates the vulnerability of the mighty human. An elephant may appear from nowhere and fence out the vacant thoroughfare. The road is shiny under the scorching sun. Unless you are a non-native fond of getting a tan, walking down may not be the best idea. The hemisphere like no other offers endless opportunities for water-sport enthusiasts. Just be careful about the prices. Those with pale skin and alien Sinhalese accent must be extra careful, as they will be charged exorbitantly. Some stalls perched ubiquitously along the Nilaveli beach are notorious for such acts. Worse, every single item is charged. Safety is hardly a concern for these money-laundering agents. Pigeon Island is the area for snorkelling and diving, but you need to be mindful of the prices. Some cadjan hut fences were embellished with palm leaves, giving you the feel of being in Jaffna, still miles away. Unattended shrine rooms, roofless houses, cows grazing all alone, dust spewing roads, burnt wood, cracked rocks still reign the area. War cemetery, Fort Frederick, hot springs and Navy Museum aside, the eastern province is home to many religious shrines belonging to two mainstream religions: Buddhism and Hinduism. En route, do not forget to distract yourself a few kilometres to witness the world’s largest stone statue. The statue is located at Monaragala Piriven Vihara, Rambadagalla. And then the Welgam Vehera rising from the ashes of the terrorist attacks. Miracles abound the temple, as no bomb blast could claim its Bodhi tree. The region looks forward to your exploration. But do not forget your essentials. Have a big canteen of water in your backpack or the dickey. Extra batteries or power bank will be an added advantage as data reception is fully functional in this area. Read the sky deep into the night. Rise early to witness the daybreak sneak over the horizons with its large golden plate - sunrise, that is - and saffron rays that ring the sun add yet another blissful moment.